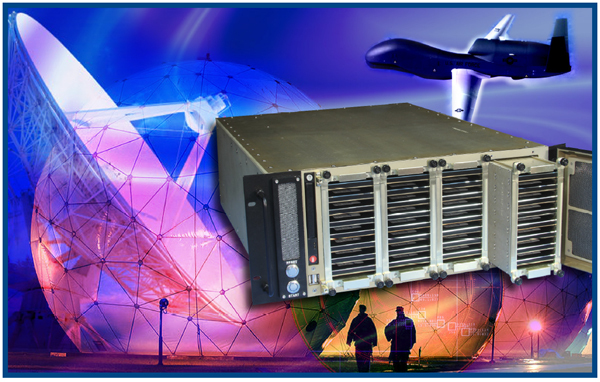 Virtually all military ground, sea and airborne platforms rely on wideband signal and data recorders for surveillance, interception, and monitoring of signals from sensors. Communication, radar, and telemetry systems often require recording functions for storing signals of interest or logging traffic during operational missions. Designers of these systems are always looking for critical recorder components that exploit new technologies to boost performance. These include solid state drives, higher resolution data converters, faster serial interfaces, and advanced RAID controllers. Integration of these components to maximize overall performance requires not only careful hardware and software design, but also qualification and testing to guarantee loss-free recordings under worst-case operating conditions. Each day, the already overwhelming glut of signals vital to government and military operations grows to challenge the neverending race for information dominance in SIGINT, ELINT and warfighting. Gaining this advantage can significantly improve the outcome of any conflict, ranging from a theater of war operation to a homeland security initiative. Often, the amount of information and the number different signal channels overwhelms the real-time analysis and decision-making capacity of the acquisition platform, regardless of whether it's a small unmanned vehicle, a fighter jet, or even a battleship. Recording this information allows it to be reviewed and forwarded to an analysis facility as required. However, when the opponent develops new encryption and anti-detection techniques, existing equipment cannot extract information from the signals and new receivers must be designed. Wideband recorders can capture these new RF signals so they can be analyzed, and then used iteratively in testing during the development of new or enhanced software radio equipment. Fortunately, wideband recorders can be equipped to handle both chores: routine collection of information streams and raw recordings of unknown signals. To operate successfully in these applications, wideband recorders must satisfy tough requirements. Because shock and vibration are notorious challenges for a rotating media hard drive, an increasingly popular alternative is the solid state drive (SSD). Other environmental factors such as temperature, humidity, and altitude, dictate specific design strategies for operational compliance. Some recorders must capture signals based on a hardware gate or trigger, such as a radar system recorder which may need to capture repetitive radar pulses and skip the intervals between them. Several recorders at different locations may need to start capturing data at the same sample clock to calculate the position of a satellite through triangulation using the relative phase the received signals. This often requires a GPS receiver in each recorder, fully integrated with the recording software and hardware. An increasing number of applications require precise time stamping of each recording, often resolved to a specific sample clock. High bandwidth analog and digital inputs push recording rates far beyond the capability of a single drive, forcing the use of RAID controllers to aggregate the speed of multiple drives. Often, recorded signals represent highly sensitive information, so the data must be physically removed from the vehicle or craft after the mission for transport to a secure facility. In some cases, recorded data must be encrypted in the event the drives fall into enemy hands through a vehicle mishap or a security breach. Perhaps the most fundamental requirement for these recorders is the bottom line: they must capture data continuously at the required rate for a specified duration under all conditions with absolutely zero loss of data. Offering size, weight and power factors much lower than rotating media drives and inspired by enormous market opportunities, SSDs continue to benefit from new technology rapidly evolving over the last several years. At the same time, costs and performance levels are steadily improving. Table 1. This table compares typical features of rotating media drives and SSDs by highlighting the winning advantages of each. Unlike rotating drives, SSD costs are dropping quickly and technology is advancing rapidly to help narrow the price gap. 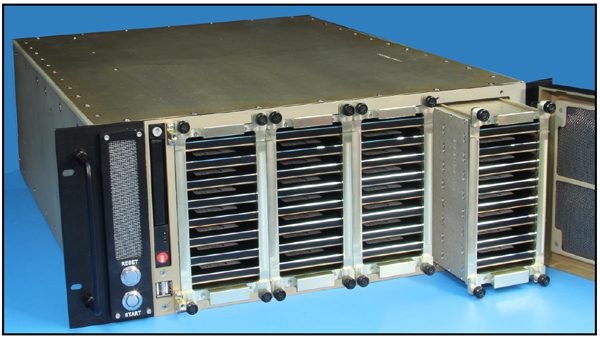 For MIL-AERO systems, a primary benefit of SSDs is their immunity to shock and vibration. In older systems, extreme measures of protection were required to isolate these effects from rotating drives to maintain head-to-platter alignment for reliable, sustained operation. This factor made systems bulky and expensive to maintain, so SSDs naturally presented an immediately attractive alternative. The latest generation of SSDs offer data read/write speeds far exceeding those of rotating drives, which also suffer from track seek times and rotational latency delays. This means fewer SSDs are required in a RAID array to meet a guaranteed recording rate. However, in spite of their many benefits, each SSD memory cell suffers from a finite number of write cycles before it can no longer retain data reliably, referred to as "endurance." To mitigate this problem, SSDs include micro controllers that keep track of how many times each cell is written to, and allocate new write operations to cells with low write counts. Other algorithms move data from high write-count cells to those with lower counts as a background housekeeping task. These measures and others are collectively referred to as "wear leveling". Since each SSD vendor uses unique and proprietary wear leveling technology, the "down time" to perform these operations can be significantly different, making some SSDs completely unsuitable for sustained, real-time recording. Performance levels from a single vendor can not only vary widely from model to model, but also between revision levels of the same model. For this reason, recorder system vendors must thoroughly qualify each production batch of SSDs to ensure proper operational margins. 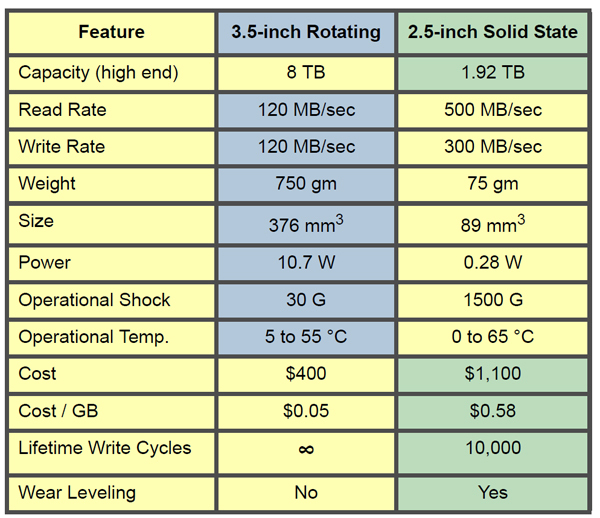 To characterize endurance considerations, SSDs were originally rated for a maximum number of write cycles per memory cell, shown in Table 1 along with other comparisons to rotating drives. An increasingly popular specification for endurance is the number of bytes written into each drive during its useful lifetime, commonly expressed as a TBW (terabytes written). Yet another method specifies either the warranty period in months or years along with the maximum number of drive writes per day, or DWPD. In spite of endurance issues, because they have no moving mechanical parts, SSDs are generally considered more reliable than rotating drives. Nevertheless, one class of applications not recommended for SSDs is continuous looped recording, such as a video security camera system which simply overwrites the oldest data. Because data is being written continuously, the TBW limit of an SSD are likely to be exceeded before any mechanical failure of a rotating drive. Finally, prices of SSDs are dropping rapidly due to market forces and healthy competition. In order to protect data recorded during sensitive missions, a new class of drives called SEDs (self encrypting drives) has emerged. They use a unique AES-256 key to encrypt data as it is written to the drive without impacting read/write speeds. The encryption key is stored within the drive in a write-only memory. Each time the system is powered up, the encryption key must be re-entered to restore access to the drive. If an SED drive is removed from the system because the encryption key cannot be retrieved, all data on the drive is completely inaccessible. However, if the drive is installed on another system, and the original encryption key is entered, data is once again available. This elegant approach satisfies security requirements for virtually all secure applications. Another major benefit of SEDs is the instant erase feature which destroys the current encryption key and automatically generates a new one. The drive can now be installed in a new system, and initialized with a newly generated key, just as if it were a new, empty drive. This eliminates the drastic data scrubbing measures often required of drives that must be retired from service or moved to non-secure locations. The electromagnetic spectrum suitable for signal propagation and reception presents a virtually unlimited number of targets for intercepting and recording critical information. Exploitation of each precious frequency band for maximum information bandwidth, reliable performance, and adequate security mandates complex digital signal processing techniques at both ends of the signal path. Spread spectrum techniques and the insatiable demand for data at every level of the economy can only be met with wideband modulation schemes. This drives need for fast data converters to capture and generate these wideband signals to keep pace with vast markets of communications, radar, and wireless networks. Figure 1. Models 7070-320 PCIe and 5973-320 3U VPX. 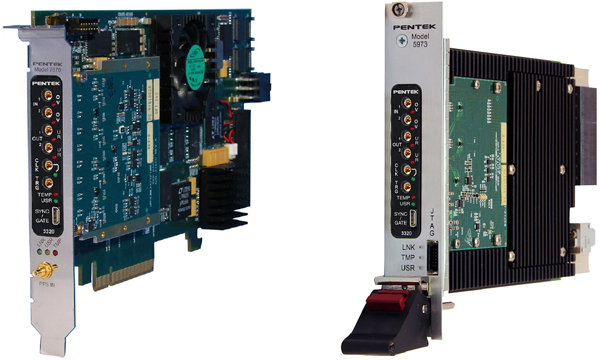 Two wideband analog I/O modules featuring dual 3 GHz 12-bit A/Ds, dual 2.8 GHz 16-bit D/As, Virtex-7 FPGAs, and DMA engines supporting PCIe Gen 3 x8 PCIe data links to system memory. Monolithic ADCs (analog-to-digital converters) operating at sampling rates of 3 GHz and above can directly digitize signal bandwidths of 2 GHz. Dealing with this torrent of digital samples in real time is often a task for a local ASIC or FPGA to extract the required information (typically digital down conversion, demodulation, decoding, etc.) which usually results in a lower data rate for subsequent downstream processing or recording. However, some wideband recorder customers want to capture all digitized information at the full bandwidth, so that the extraction of information from unknown signal types can be attempted later on in the lab. In this case, the recorder must be capable of continuously recording gigabytes of data each second, perhaps for hours or days. Recorders take advantage of ADC and DAC board-level products, which provide the interfaces between the data converters and the CPU. FPGAs offer a popular solution for this task because of their configurable I/O ports using high-speed parallel LVDS and gigabit serial links to match the specific requirements of each data converter. They also are equipped with standard PCIe interfaces capable of supporting PCIe Gen 2 and Gen 3, with 4, 8, or 16 lanes. FPGAs can also implement the critical timing, triggering, gating, synchronization and time stamping of the recorded signals. In addition to analog signals, many recorders must store high-speed digital streams arriving in a wide range different formats and protocols, but Ethernet dominates due to widespread adoption and lowcost hardware infrastructure, including optical and copper interfaces, cables, routers, host adapters, and switches. Virtually every computer system now sports one or more 1GbE ports, but higher-performance systems are migrating to 10, 40, and 100 GbE ports. Recording systems take advantage of commercially available Ethernet adapters that handle dozens of different interfaces including several types of copper cables with different numbers of pairs, data rates, shielding, connectors, and coding protocols. Optical adapters accommodate single-and multi-mode fiber with different wavelengths, data rates, cable types, and optical connectors. Fortunately, most of these adapters use PCIe interfaces suitable for connection to virtually any CPU chip set and come with drivers for all popular operating systems. Unlike Ethernet adapters, which are usually ASIC-based, other types of digital I/O adapters often exploit FPGAs, for the same reasons they are used for data converters. Configurable I/O transceivers and state machine engines implemented with configurable logic support SerialFPDP, SerialRIO, Infiniband, and parallel LVDS interfaces and protocols, and they deliver data to the system across PCIe. Today's recording systems benefit from a wealth of new technology developed for the data server market, including RAID controllers and server-class computers. RAID controllers join multiple disk drives, typically using SATA or SAS ports, to the system over a PCIe interface. They perform two functions vital for wideband recorders. Figure 2. Pentek RTX 2766 ruggedized airborne recorder features four removable, hot swap QuickPac® drive packs, each containing eight SSDs in RAID arrays for easy transport of up to 60 TB of recordings to a secure facility. First, by striping reads and writes across each of the connected drives, RAID controllers aggregate the individual access speeds of each drive. With new SSDs rated for transfer rates of 500 MB/sec, a 16-port RAID controller using a PCIe Gen 3 x8 interface that can sustain guaranteed read/write rates of 4.8 GB/sec for the array. Secondly, RAID controllers also aggregate the capacity of the drives for longer recording times. In the example above, using 1.92 TB drives, the combined capacity is more than 30 TB, providing a recording time of over 1.75 hours at a recording rate of 4.8 GB/sec. Fast RAID controllers and fast data acquisition boards are useless without a powerful PCIe system environment. Server class PCs feature chip sets that join the CPU and fast SDRAM system memory to a number of PCIe slots and peripherals. The latest chip sets support DDR4 SDRAM with 2400 MHz transfer rates, and multiple PCIe Gen 3 ports with up to 16 lanes. In operation, system memory is used as a staging area for data buffers. Data acquisition boards use internal DMA (direct memory access) controllers to move data across PCIe into buffers in system memory. Once initialized, these hardware engines take care of completing the transfers with no CPU overhead. Likewise, the RAID controllers fetch data from system memory across PCIe using their own DMA controllers, and then stripe the data writes across the array of disks. Figure 3. Hardware DMA engines in analog or digital interface modules and RAID controllers take advantage of fast PCIe data links to and from buffers in system memory provided by new chip sets in server-class PCs. The CPU supervises these transfers, but never actually touches the data so real-time performance is maintained. As shown in Figure 3, this basic scheme of moving data with hardware engines across a well-defined PCIe fabric, and without CPU intervention, ensures real time performance for wideband recording applications. Although the CPU never "touches" the data in the scheme outlined above, the system CPU must orchestrate the transfers by setting up the number and size of data buffers in system memory before the recording starts, and then monitor the progress of each DMA operation during the recording. While simple in concept, choosing the appropriate transfer parameters is critical to achieving guaranteed real-time operation, primarily because of system latencies. Such latencies occur because of the burst transfer nature of DMA packets and often conflicting priority levels for myriad system processes. Each recording system requires an optimized configuration based on the number of channels, guaranteed recording rates, characteristics of the RAID array, and the architecture and chipset of the system PC. To accomplish all of these requirements, Pentek offers its SystemFlow recording software for the Talon family of recorders running under Windows operating system. SystemFlow also includes a GUI for ease of use, and a Signal Viewer utility to monitor acquired signals in time and frequency domains before, during, and after the recording. An API (application programming interface) library allows Talon recorders to be controlled from a remote facility or a larger system, where the recorder acts as a front-end or back-end peripheral. Wideband recorders draw upon diverse disciplines of new technology to keep pace with growing demands of burgeoning information traffic, both in the number of channels and in signal bandwidth. Fortunately, many of these technologies are driven by large worldwide market forces, which feed off our planet's insatiable need for connectivity and storage.